Mattress pads are a good idea. They can protect your mattress if your baby spits up or diaper leaks. We recommend organic mattress pads for the same reason we recommend organic crib mattresses. Babyies do not need to be inhaling chemicals when they sleep. For safety, it’s best if they are placed between the mattress and a snugly fitted sheet. For people who cannot afford an organic mattress, an organic mattress topper is a good solution. 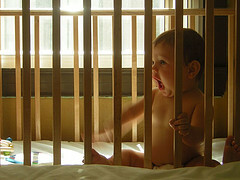 It will provide an organic barrier between baby and the conventional mattress. Mattress toppers can also offer a softer pillow top feel to an organic mattress.